There are 11 units in all, sleeping a total of 28. The units are well spaced out in the lodge's extensive tropical gardens which feature streams, waterways and ponds. This gives privacy and ensures an atmosphere of peace and tranquillity. 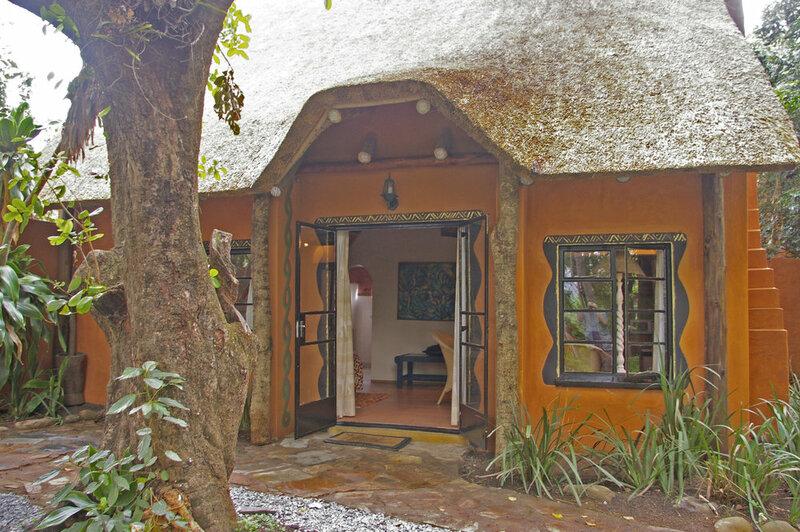 Cottages 1 & 2 : Are double storey thatched cottages, which sleep a maximum of 5 people, upstairs there is a double bed and a single bed and downstairs there are 2 single beds. The cottages are very comfortably furnished, with a fully equipped kitchen, bathroom downstairs, fireplace, braai facilities and large private gardens. These cottages are ideal for families. Cottage 3 (Guest Suite) : A cosy one bedroom cottage with a king size bed, en suite bathroom, a fully equipped kitchen, covered veranda, braai facilities and a large private garden. Beehives 1 and 2 - The stylishly ethnic beehives are in a stunning location with a magnificent view over the waterfalls down to the valley below. The beehives are luxurious and romantic versions of Swazi traditional accommodation complete with windows and en suite bathrooms, done with natural materials and original artwork and ceramics. Beehive 1 contains a king size bed and sleeps two. Beehive 2 contains a king size bed and a single bed and sleeps three. Tented Camp (Tents 1 and 2). These safari tents are situated on the edge of the river, apart from the rest of the lodge. Each tent has a double bed and a single bed, carpeting and electricity. These tents share a stone-and-thatch fully equipped kitchen, which has a lounge area and a balcony overhanging the river. Tents have a private separate bathroom with shower 35 metres away with a 20 stair climb. Standard Safari Tents (Tents 4). This tent is nestled in the riverine forest with its own private balcony overlooking the river. The is very comfortable and has a double bed and a single bed, it is also fully carpeted and has electricity. This unit has a private separate bathroom with shower a stone's throw away from the tent. Tent 5 has a large deck, a queen size bed and an en suite bathroom with bath and shower. Tents 3 & 6 have a deck, a double bed and a single bed with ensuite bathroom with shower.